Chocolate shot glass molds are a lot of fun no matter what you put in them. Use them to hold little treats, fruits, or shots. It’s an edible holder for whatever you choose. Last time, we did chocolate shot cups with a peach milkshake. 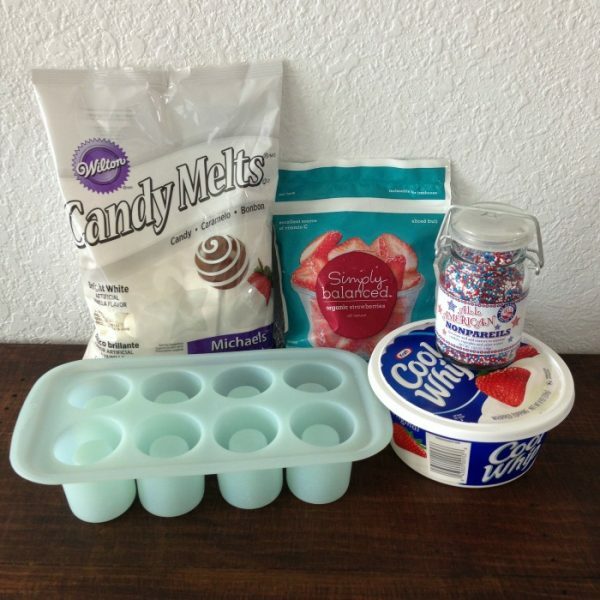 This time, the recipe is for red, white, and blue cups perfect for the 4th of July or any patriotic holiday. 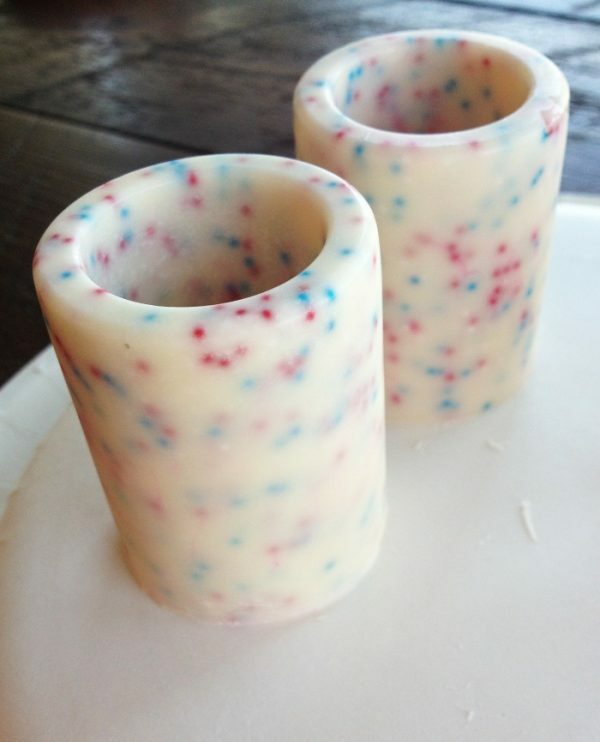 Enjoy these white chocolate shot glass molds during all of your summer celebrations. Using one cup of white chocolate candy melts at a time, place in a medium microwavable mixing bowl. Heat in the microwave for 60 seconds. Remove and stir. Repeat in 20-second intervals, or until completely melted. Be sure not to overheat. Remove from microwave and stir until chocolate is completely smooth and silky. 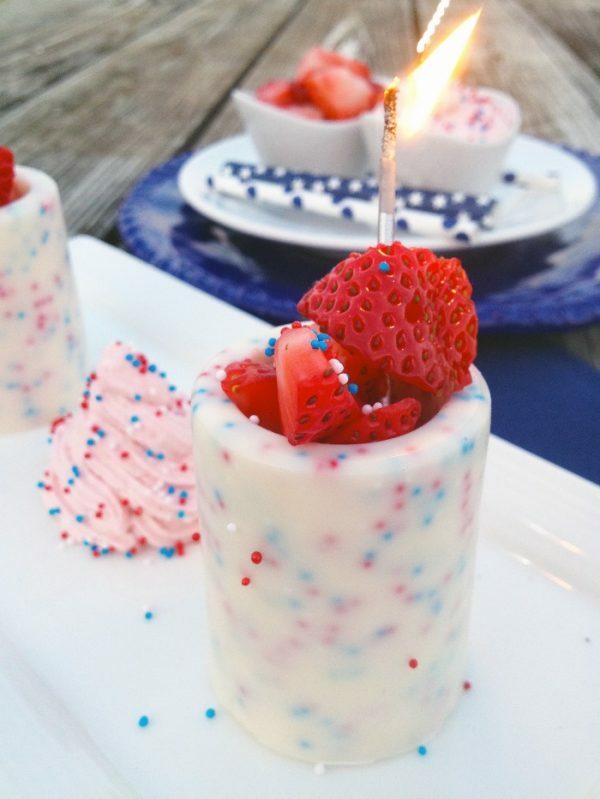 Add red, white, and blue sprinkles to chocolate. Stir until the sprinkles evenly distribute. Using a small spoon, slowly pour white chocolate into each shot mold. Be sure that the mold is thoroughly clean and dry ahead of time. Repeat this process until all 8 shot molds are filled. Tap mold against countertop to ensure all air bubbles are gone. Lift mold above your head to check for air bubbles. If there are none, you may proceed to the next step. Otherwise, repeat tapping. You may also stick a butter knife into each mold to help eliminate hidden air bubbles. 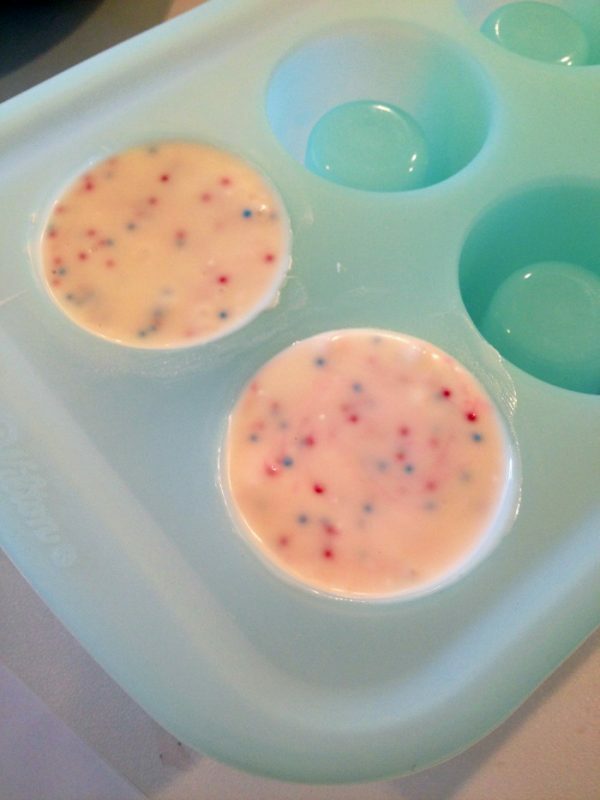 Place mold in freezer for approximately 30 to 40 minutes. Remove mold from freezer. Slowly invert each shot mold until white candy melt is released. Carefully place each mold upright onto a clean, flat surface. Using a blender, (I prefer the Magic Bullet), blend whipped cream and strawberries for approximately 30 seconds. Make sure strawberry whip has a nice weight to it. You can continue to add cool whip or strawberries to obtain your desired consistency. Chop strawberries into small pieces. 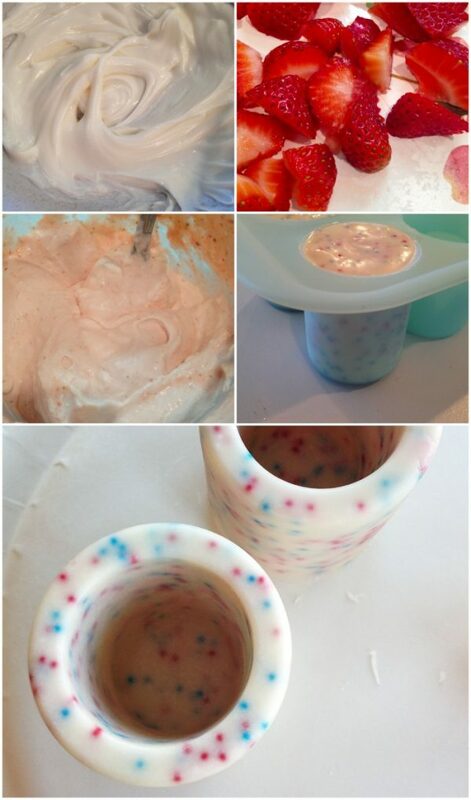 Fill each white chocolate cup with strawberries. Add a food pick for easy eating or garnish with a sparkler candle. Plate strawberry whipped cream on the side, or you may fill cups with whipped cream AND strawberries – whatever you desire. If you’re looking for ideas to put in the edible shot glass visit our cocktails page. What will you put in your chocolate shot glass molds? Such a fun idea. Looks great. Thank you for sharing with us at #HomeMattersParty. We would love to have you again this week. That’s fun! I would definitely fill it with tons of fresh fruit! What a delightful and festive recipe/project! My grandkids would love sipping juice and chocolate milk in these. This is super cute! I would totally fill it with fresh fruit. It’ll just add a pop of color to contrast the white chocolate shot glass! This is great for parties and cookouts! Now these are just AWESOME!!! How on earth did you come up with them, LOL! I am totally going to be trying these. Thanks so much for the idea. How do I not own that mold? It’s so cute and perfect for little treats. Your red, white, and blue variety are just adorable.